One aspect of the prestigious Google Innovator status is to create a moonshot project. This is not as easy as it may seem. What change will the project create? If it only affects a small portion of society, then the change is not a moonshot. I first applied to the Google Innovator Program last August for the #TOR16 Cohort. My project, the Techy Two by Ten, was not accepted. Why? Because the project only affected a small group of people - me and teachers like me. It did not change education. I was sent back to the drawing board. Moonshots are not created nor achieved in isolation. Fortunately, Michelle Armstrong helped me see that what my students had already completed was the beginning of a moonshot. The Compton JHS Yearbook class had created a 100-page full-color yearbook in Google Slides for only $8.16. What we had created was remarkable, but our work was not done. And, even though I was not the yearbook elective teacher for 2016-2017, I could share this Innovator Project with the world. Educators could create memories and students could become graphic designers. Google Slides could become a free graphic design platform. 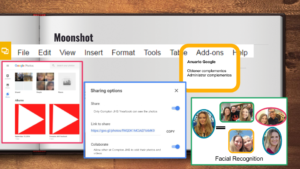 Moonshot: Google Photos with school privacy settings, Google Slides Add-ons, and Facial Recognition. 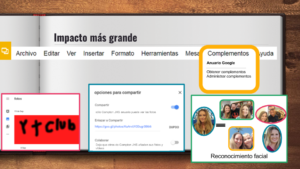 Impacto más grande: Google Fotos con privacidad escolar, Complementos en Presentaciones de Google, y Reconocimiento facial. Why are yearbooks still needed if photos are shared daily on social media? Technology changes. I cannot open my zip disk from college, but I can open my mothers 1963 yearbook. In the future, I won't be able to open the photo CDs my father sent me, but I will be able to open the hardback family biography he published this January before he passed away. Even in the digital age, physical books have their place. I applied for and attended the Google Innovator Academy that was held in Mexico City from Nov 30-Dec 2, 2016. A benefit of being a second language learner was that I listened more than I spoke. Five months later, SlidesYearbook is going strong and the moonshots are within reach. While I will learn how to create Google Slides Add-ons, I have great hopes that others will join me on this quest. For each moonshot listed below, a temporary fix exists. Will you help me change how yearbooks are created and saved for future generations? Google Photos does not have school privacy settings and not a core-app with FERPA protections. Create an organizational structure to share images. Read Setup | Configuración. Make Google Photos a Core-app with school-level privacy settings that prevent downloading and include time (year) limits. A website like SlidesCarnival with student created yearbook designs that they Submit for Creative Commons use. Benefit: an international Creative Commons community dedicated to student creativity and creation. Insert grid or graphing paper as a temporary image to align images. Learn from the best - study SlidesCarnival designs and complete Canva Design School. Benefit: Both students and teachers can apply graphic design skills learned for SlidesYearbook to other projects. The best ideas are not created in isolation, hence the reason Google Innovator Academies with year-long mentors were established. Even with the help of the #Mex16 cohort and my mentor Patty Zamora, this moonshot will go further if more people work on this project. Edtech leader, trainers and educators are making #SlidesYearbook. Alice Keeler, Edtech author and presenter, shares the Create a Yearbook Using G Suite blog post with her Twitter followers. Edtech trainer Eric Curts posted the link in his What's New in Google - January 2017. Educator and trainer Mareena Kohtala shared #SlidesYearbook at a Technology Conference demo slam (and won). #TeamBCSD teacher and CSUB adjunct professor Eddie Gonzalez invited me to speak to his class of future teachers in February. You are another person who can make this moonshot a reality. Please help me teach students graphic design as they create their own memory books. If you are a teacher, place this project in your students' hands and see where it takes them. Share their ideas, templates, and videos! If you are a developer, help us make Google Slides a graphic design platform with add-ons. Moonshots may start with one idea, but they change the world when groups of people are inspired to work together. Moonshots are not meant to be taken alone. To learn more about SlidesYearbook, please start with Graphic Design in Google Slides.